We see so many men driving, displaying and working on, historic vehicles that it is easy think it is a ‘male thing’. We have several lady owner/drivers in the Cornwall Austin Seven Club who drive their ‘Seven’ regularly on Club events and attend rallies. Two tell their story. I was learning to drive as soon as I was seventeen years old and on the ‘look out’ for an old ‘banger’. A school friend of my boyfriend had gone on to London to university leaving a 1937 Ruby in his father’s garage. My boyfriend and I bumped in to this friend’s father in Gloucester one day and we asked him if we could buy the old car since he was grumbling about the space it was taking up. It took several months of negotiation and eventually I paid 7/6d deposit and agreed to pay seven pounds ten shillings for the car. I had not actually seen the car but our friend assured us it was a good runner but needed a bit of doing up. It was spring 1962, snow was so thick that travelling was very difficult for weeks with much ice on the roads and snow six foot high in places. My driving test was cancelled because of the arctic conditions. When the snow eventually melted a little we drove to Painswick to collect get my unseen purchase. We were in for bit of a shock, the core plugs were projecting on ice pillars; one side of the car had been stripped of paint and had had a coat of emulsion pain applied to it, the rest was bare metal where paint had been removed. We towed her home with a bit of rope, no strict regulations for towing then, and I could not wait to get started. My boyfriend and father did the mechanics and electrics and I worked on the body. 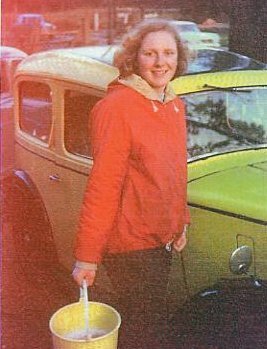 Being only seventeen I was not at all interested in painting the car the original colour, which was dull grey so I bought a tin of Valspar bright yellow gloss paint. My dad had a tin of proper coach paint, black, which he gave me so I painted the wings with this and the body bright yellow. I called her “Wopsie”, a Gloucestershire name for wasps. I cut up some old carpet for the floors and got some leather paint to brighten up the seats. She was my pride and joy and I drove her to work every day. 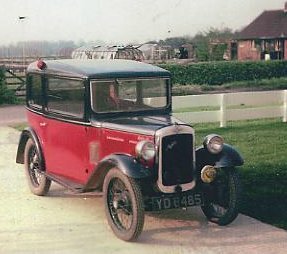 My father then found another Austin Seven for spares, but when we got it home it was older, a 1934 Box, and we decided to do her up. This one I painted maroon and black and called her 'Lady G' as my surname was Gait. When she was finished I tearfully sold 'Wopsie' to a young man and drove 'Lady G' to work instead. I subsequently married the boyfriend and we lived out in the country. I found drivers kept cutting me up and made no allowance for my cable brakes! My father in law was in the car trade and he found me a lovely frog-eyed Sprite and suggested I might find it safer to drive and thought I might like a sports car. He was right, so again I had a tearful sale of 'Lady G'. 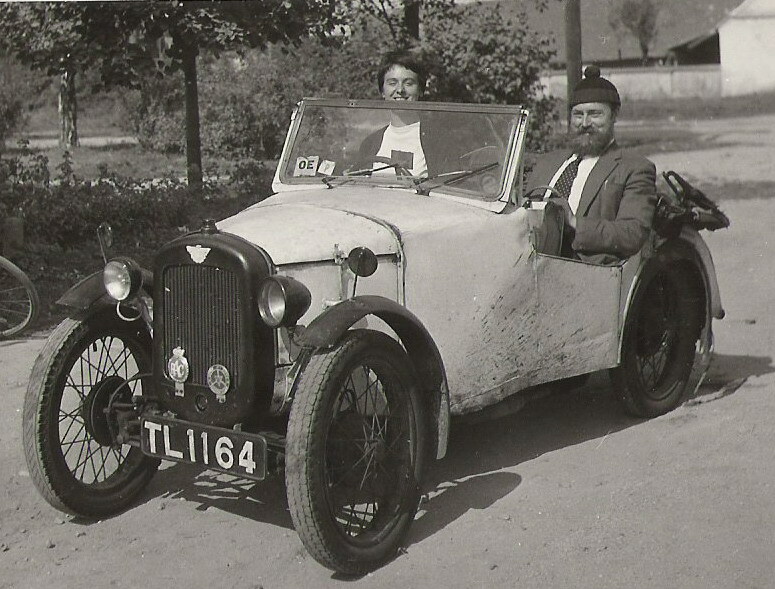 That was the end of my Austin Seven fun for a long time.When Bob and I moved down to Bratton Clovelly we saw ‘Susie’ the car John and Elaine Morgan purchased at Treburley garage and I got all sentimental and enthusiastic about Austin Sevens again. We did not buy Susie but later saw the 1936 Opel we now drive. When we joined CA7C Andrew Jarmin kindly looked up both registration numbers of my cars on the A7CA Surviving Chassis register and I was delighted to find that 'Wopsie' was still listed. I made contact with the owners. They told me that in 1962 they had seen 'Wopsie' around the area where I lived and noticed that suddenly it was no longer about. They went to see a relation of theirs a couple of weeks later and there was 'Wopsie' parked in the road by their relation's house. Apparently the young man I sold her to drove her too hard and did some damage to the engine. The couple then bought her from him and drove her daily for 20 years. They restored her to her original colour and belonged to Bristol Austin Seven Club. They still have the car and sent me a photograph of her taken some 20 years ago. She is kept in a shed in their garden and has unfortunately been there for at least 17 years and not touched. I asked if I could go and see her but they declined. 'Lady G' was not traced so perhaps she ended up on the scrap heap – I hope not, I am still fond of her all these years later. Sadly, Jenny decided to sell the Opal in Feb 2010, fortunately to another club member. This article, written by Jenny Gardner, originally appeared in CA7C Seven Focus in Mar 2008 pp17-18. In July 2008 I will have owned my special, TL1164, for exactly 50 years. This may look like something of a record, but perhaps an even more surprising slant is that during these years 'Tilly' has only been in use for 5 years. I used her from 1958 until 1961 when Ken and I bought our saloon, CG4191. We had hoped to keep both cars on the road - a Summer Austin Seven and a Winter Austin Seven - but that hope never materialized. Between September 2004 and September 2006 'Tilly' was rebuilt by Lee Webster. According to my wishes he kept 'Tilly’s' body very similar but we decided she needed doors. Other improvements included 12 volt electrics and hydraulic brakes, both of which I knew Ken would have appreciated. After 45 years laid up, rotting in various garages, she passed her MoT in September 2006. That was her first ever test because the MoT wasn’t introduced until after she was taken off the road in 1961. When we bought 'Tilly' she cost £25 and we started using her straight away. I was 28, the same age as 'Tilly', but she was my first car and I hadn’t passed the test. Ken had very bad eyesight and no licence but I used to drive all over London with him in the passenger seat. Several times I was stopped by the police asking to see my provisional licence. Amazingly no-one ever asked for Ken’s licence! However, I took a course of lessons with the BSM and passed the test. As well as using 'Tilly' to go to work in Knightsbridge where I left her in Hyde Park, visible from the office windows, we used her for holidays in Cornwall and to visit my family in North Wales. In 1959 we took her via Germany to Prague in Czechoslovakia. We saw no vintage vehicles in Germany where 'Tilly' was considered a joke, but quite a few in Czechoslovakia where she was loved. The Czechs had recently got vintage cars out of garages where they had been stored during the war. Ken used a Bolex 16mm camera perched on a tripod as he sat beside me. I still have the rolls of film, the quality is excellent but it remains unedited; I might yet make something of it. I do cherish a few photos taken by two Czech students touring on a motorbike. We stopped by a vineyard and they dived into the field to pick armfulls of grapes which they gave us. Later we received a letter from them with prints of their photos. In 2007 we drove both my Austin Sevens to Beaulieu, but that is a trip best forgotten because of appalling weather and several problems with the cars. 'Tilly'’s 12v conversion has been a continual source of problems. Otherwise she goes well and I use her here on runs with the Cornwall Austin Seven Club and Cornwall Vintage Vehicle Society. Through research I have discovered that 'Tilly' was originally registered in 1930 in Lincolnshire, a black fabric saloon! I am very pleased to have both my Sevens on the road. They are no longer my everyday transport which is the job of a new Toyota. Lee and I manage to keep up with the maintenance but with him several miles away and us both getting on a bit it can be a struggle! This article, written by Lorna Blewett, originally appeared in CA7C Seven Focus in Apr 2008 pp13-14. 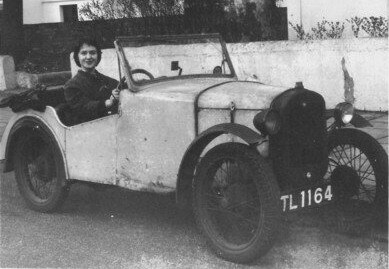 Sadly, Lorna passed away in June 2018, aged 88, the last of our members who was odler than her Austin Seven! 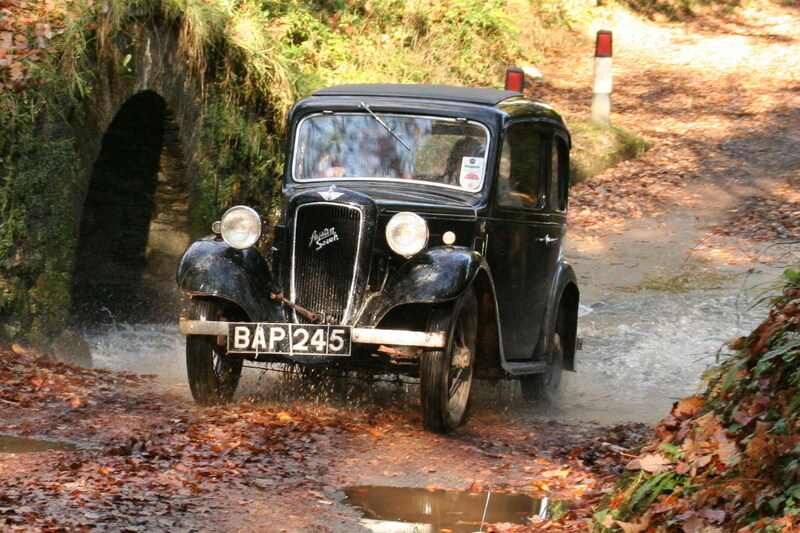 Another lady clocking up the miles is Regi Jarmin of Stithians who bought a 1933 RP Saloon as a wreck in 1989. 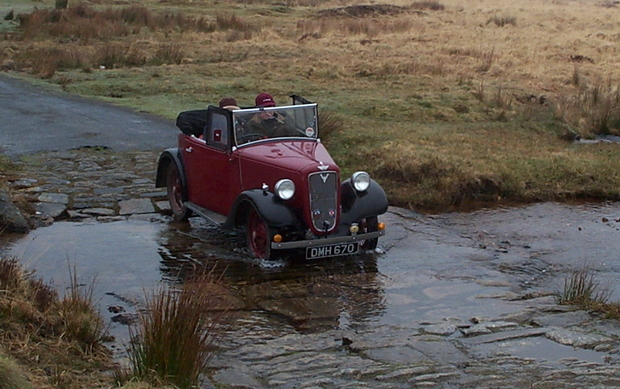 After much work by husband Andrew it was on the road in 1992 and with barely 50 miles of ‘Austin Seven’ driving experience she drove from John O Groats to Lands End (the JOGLE) in 44 hours, and since then has made two double End to Ends, the last return trip in 23 hours and 13 minutes. Regi has also been on holidays to Scotland, Wales, Ireland, France and Jersey plus several holidays in Devon, and as a regular on Club events she has driven just over 33500 miles to date. In all that time only a condenser has been replaced at the road side, also one puncture and a few blocked jets! Regi also owns a 1929 Van Type AD manufactured by Thomas Startin of Birmingham, which is also driven on events. 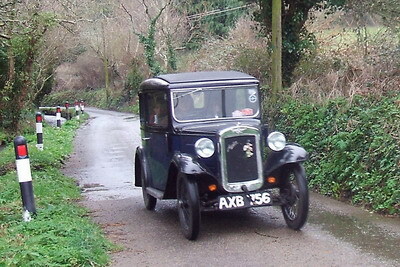 Dorothy Murrish of Chacewater purchased her 1933 RP Saloon in 1986 from a family in Falmouth. Being another avid ‘Seven’ owner/driver Dorothy is a regular on Club events and has enjoyed trips to Holland, Brittany, Southern Ireland, Wales, Le Mans in France where she drove round the Bugatti circuit, and other Club holidays in Devon. She also did the JOGLE in 2000 driving through the night to complete the journey in 22 hours and 30 mins. Dorothy averages 3000 miles per year and has had no major breakdowns although will admit to once putting diesel in the petrol tank and having to be towed home! 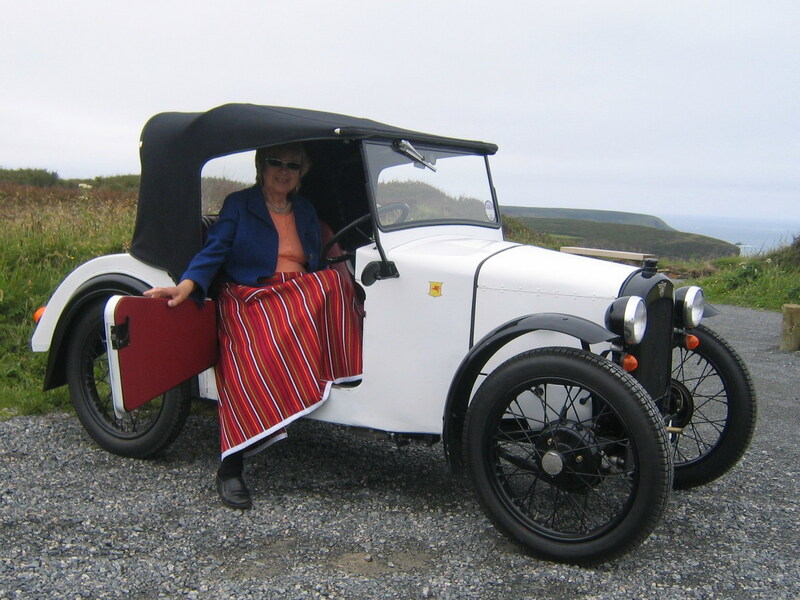 Ann Brown of Carnkie, Wendron still takes her left hand drive 1934 Tourer on Club events after enjoying many years of ‘Sevens’ with her late husband. Sue Doyle of Camborne has to combine driving her 1937 Ruby with being a mother of a young family. 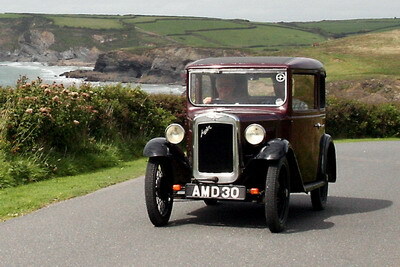 Tamsin Coxen of Truro has a 1931 RM Saloon which she drives when work commitments allow. 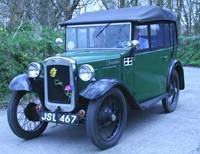 Freda Capel of Collumpton has a 1933 RP Saloon supporting CA7C and Bristol Austin Seven Club events. Wendy Waters of Goonhavern drove a 1935 Ruby, but sold it in 2015. Several other ladies also drive occasionally, but are not necessarily owner/drivers. 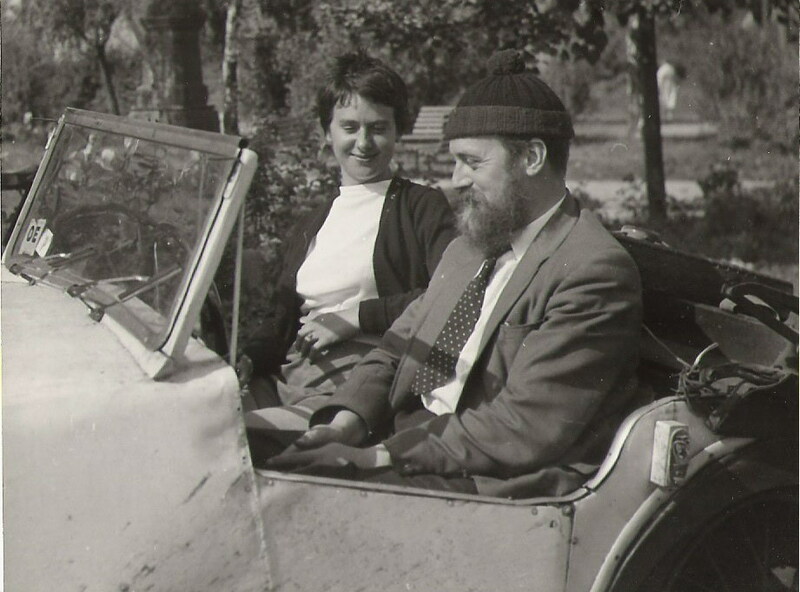 The pleasures of owning and driving an Austin Seven can be enjoyed by both men and ladies. CA7C offers a lot of technical support for the ladies who are not so mechanically knowledgeable or able. 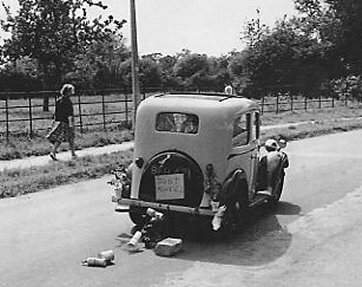 So long as the owner/driver can carry out the basic maintenance checking and topping up the oil and water, the tyre pressures and a few other minor things, then any lady driver can soon be enjoying the freedom of driving an Austin Seven.